Today was a partly cloudy day with some sunshine at times. We had some dark clouds and threats of rain but only got a few sprinkles. They don’t need any more rain in this area. They had some heavy rains early last week and the ground is still saturated. The Mississippi River is in flood stage already and they haven’t got the northern snow melt water yet. Hopefully we can get down to the river tomorrow afternoon and get some pictures. Rita and Dave were down there this afternoon and said it was impressive. For breakfast today we had a wonderful omelette. 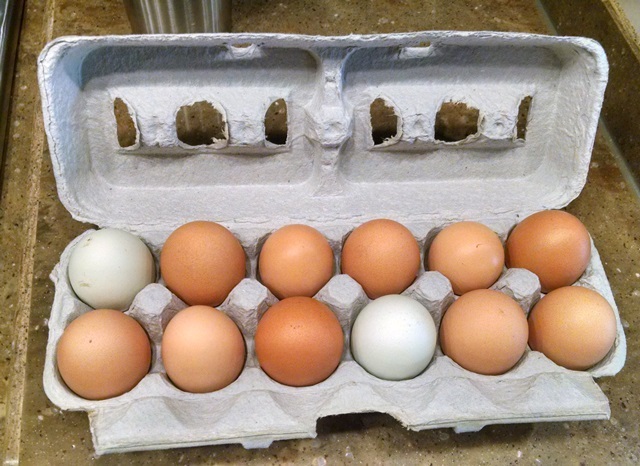 Our construction coordinator’s wife has chickens and he brought us a dozen very fresh eggs. Thanks, Charles! Today was official move in day and we now have all six couples and RVs safely in place. It was great to meet the new arrivals and start getting to know them. Always good to get everyone settled in. We also helped unload food for the college kids today, lots of food, and moved in some additional furniture for them as well. We will attend church together in the morning here at Francis Asbury UMC and then have our opening team meeting at 6:00 tomorrow evening. Tonight we are still waiting for the bus load of 50-60 college kids to arrive. Suspect our quiet little parking lot will change drastically in the next 30 minutes. Hope everyone is having a good weekend. 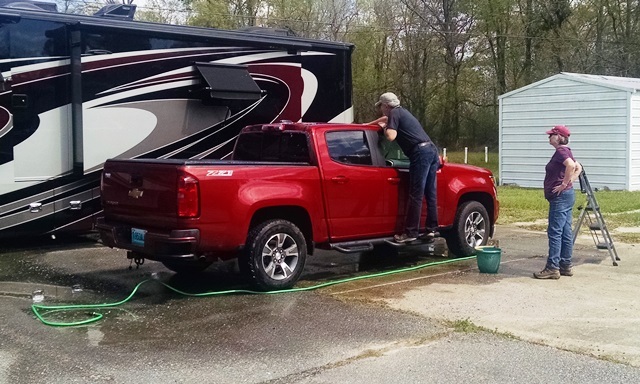 Rita decided she would wash their truck after they arrived.